Sometimes, when you have a lot of children, especially at such young ages, it’s tempting to crawl up in a hole and stay in safe places and wait it out before entering the big wide world until they are more responsible and less inclined to run away and in need of a parent in eternal pursuit of mischievous bodies. Being a homebody, it hasn’t bothered me all that much that we have spent a lot of time at home in the past year. However, in December, we choose to venture out into the big wide world in spectacular fashion. A good old fashioned road trip. Only with air conditioning included. Oh, and DVD’s and Nintendo DS. No sense losing some sanity to go completely vintage. Except for our youngest passengers. Poor kids had a brand new DVD player to watch and it stopped working by the 2nd day. They travelled 5 other days keeping themselves entertained with toys. Bravo babies, bravo. The journey was a December trip from our home in South East Queensland to have Christmas with family at Cairns in Far North Queensland. We drove an impressive 4,405 kilometres (2737 Miles) from start to finish. One van, (our Kia, Grand Carnival), and seven people packed into it. Three 14 month old babies, a 3 year old, a 6 year old and a very brave Daddy and Mummy. 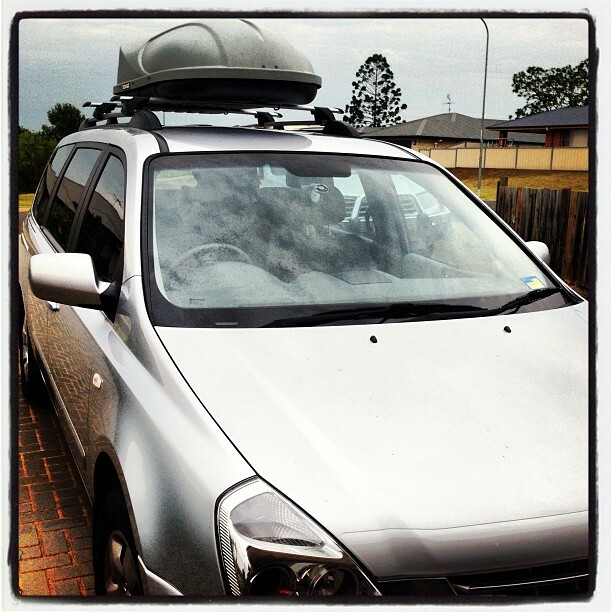 Our trusty Kia Grand Carnival. We borrowed the pod, and it was fantastic! Exactly what we needed for this trip. It was actually so much easier than I had thought it would be. I had imagined a lot of screaming and crying, getting into places late at night because of so many stops to let children stretch their legs and having to provide endless in-car entertainment. Our children, as it turns out, are awesome travelers Unlike a memorable road trip to Sydney and Canberra when Trent was a three month old baby and had cried/screamed the majority of the drive time, and I came back needing chiropractic assistance to the damage done by twisting my arm back to hold a dummy in for hours. This time, all five children were content to travel the long distances with minimal fuss. Our strategy was to get in the car and drive. (Profound, huh?) Minimal stops. It became apparent that our kids would just get in the ‘travel zone’ and we knew that it would start getting tricky getting them back into the car if we started letting them out too often. Mainly our only stops were to get petrol. Most toilet stops were on the roadside. (So easy with boys… and nappies for the babies) Our goal then was to let them have a swim in the morning before we left, so we didn’t leave ultra early. This made them nice and tired to start with. Then we would go hard during the day driving virtually non-stop in between 6-8 hours during a day and mostly arrive in time to have a swim in the late afternoon as a reward for getting there. The Christmas mobile all packed and ready to go! Our travel itinerary. The time is the estimated time to travel without stopping, so of course it took us a bit longer. It was pretty well a good break up of time for the age group we were travelling with. Next time, we will probably take two days (one night) to get there if we drive again. 2. Rockhampton – Ayr (6.4hrs) – Took a lot longer this day to get there because we stopped to visit my Uncle and his family in Mackay. 2. Townsville – Yeppoon (7.55hrs) This was the biggest travel day we did – no time for swimming that evening! 3. Yeppoon – Bundaberg (3.6 hours) We stayed in Bundaberg simply because there is a barber who has become a family friend there. The little boys were getting scruffy and I simply wouldn’t let anyone else to give Jayden and Toby their first haircuts! OK. So even with an ultra nice barber, first hair cuts can still be very scary. I love it that Matt cut the two boys hair at once. He was literally snipping a bit from one head and then going back and doing the other! If you are interested in the details of how we travelled with the five kids, I’ve put it under headings below. A common sight travelling with kids! We would get takeaway and keep driving for lunch. I know it’s not fashionable to admit that, (espcially on blogs, which you are more likely to hear the virtues of organic homemade meals!) but I have an everything in moderation policy. Plus, it was a treat for the kids and it made the trip more exciting. (As well as being great for bribery during the day!) Because my children don’t get junk regularly, it really did make the trip more of an event. I packed an insulated lunchbox full of snacks for the big boys each day. They also had water handy to sip on throughout the day. That way they could just nibble away when they were peckish or bored. I packed packets of several sized zip lock bags, this way I could pull them out each morning and fill them. I had a rule that fruit always needed to be eaten first. The packaged lunch box items are great, because they are easy to store, especially in the heat, with minimal preparation. I had bought the triplet’s “gyro bowls” for the trip. They turned out to be the best thing ever for travelling. Basically the bowl is designed to minimize food being tipped out by having two bowls that swivel, encased in a larger easy to hold casing They look like a little alien spaceship, and I was worried they would just be a gimmick, but turned out to be spill proof for big brothers to pass around the car. I had an insulated bag of triplet snacks near my seat, so at regular intervals I would fill a bowl up and pass it to Jonty, who would give it to the two babies sitting next to him. Then the third one would get passed back to Trent who would lean across and give it to the baby who was relegated to the back seat. (The babies don’t have set seats, so we always made sure they had turns at sitting in the different postions.) Any bowl that can be passed by a six year old and a just turned 3 year old and still make into a 1 year olds hands with the food still within, really does deserve to be applauded. And I have spoken the gyro bowls praises loudly to all who care to listen. This picture was obviously the first day – the only day the triplets had working DVD players. We’ve since solved the problem (why couldn’t we figure it out en route?) and they are now developing a set of square eyes during trips. But anyway, check out their groovy gyro bowls! Perfect for containing special travel treats! To be truthful, I had organised a whole lot of activities to keep the children busy, but we didn’t do most of them. The two older boys were more than content playing their DS, Leap Pad and watching DVD’s. Of course we didn’t let them do this all the time, and controlled their screen time, breaking it up into chunks throughout the day. In between using the screens, they were more than happy to talk and look out the window. It’s quite boring to report about really. Except the boys didn’t think so, and that’s the main thing. Another favourite past time for Jonty was posing for photos! The triplets were pretty much legends. They were so patient. I did have a bag of toys always in the front with me. When they started to grizzle, I would pass them back a new toy. Whenever we stopped, I would retrieve all the dropped toys and then rotate them to a different baby. Because there was a baby in the very back seat, I got an expert at throwing soft toys so they would land in the car seat in the back right hand corner! We did get Trent to hand toys to the baby also, but the toys would often not make it. The baby in the back. This time it’s Toby. 1. I loved this Travel Bingo from The Organised Housewife. We printed them out and laminated them so they could be used with whiteboard markers.Unfortunately Jonty’s headspace was firmly entrenched in Super Mario when I pulled this out. So I had to threaten there would be no DS until the bingo was complete. At all. Zilch. No more arguing. At all. I mean it. (etc. etc.) Eventually he begrudgingly played a game. For awhile there, he was enjoying it. Until we were stuck with bland scenery and couldn’t find a dog to cross off the list anywhere. The atmosphere in the car got tense. Eventually he was able to shout a triumphant bingo and in two seconds flat the car was filled once again to the tunes of Mario jumping and catching coins. 2. Towns and Cities Lucky Dip. I spent so much time before hand searching out little knick knacks. I then divided them into paper bags that had names of some of the towns or cities that we were travelling through. I gave Jonty a map, which he marked our route as we progressed. I was also going to give him laminated cards with various place names on. When he saw we were travelling through that place, he could trade the card in for a prize for him and Trent. Except, I left the bag full of prizes at home. I cried when I realised. I had stayed up really late the night before getting all the last minute things in order, so I was ultra tired. So when I realised that all my carefully prepared goodies were sitting on the dining room table at home, I pretty well bawled. Which rather alarmed the boys, and they talked about Mummy crying the rest of the trip. But anyway, if you are looking at things to do on a road trip, I’m sure it would be a great activity to fill in the time! Some of the bags which are leftover. The others have been used for bribery.. There is no doubt that road tripping is a fantastic opportunity for hours of family time. Even if the kids are playing electronic games or watching DVD’s, there is still a sense of community. We are all locked into a confined space, and we make the time pass together. (Plus, while the kids play, it’s an excellent time for Mum and Dad to chatter away about grown up things.) The moments that the devices were turned off, gave us unique opportunities for in depth discussions on life. We discussed death as we passed cemeteries, the upcoming fears and expectations of the upcoming school year as we passed rural school houses, the environment as we drove through our vast country, natural disasters as we drove through communities recovering from major cyclones. We discussed our expectations of behaviour at the various places that we were visiting, we talked about how our family works and the different personalities. Road trips certainly offer a wealth of opportunities. It’s a reminder that it’s not just the destination, it’s also the journey that will last in our memories. I pretty much laughed all the way through this. 🙂 I still think you’re uber brave for driving all that time, no matter how much you deflect with an “eh.” Within 6 months, we did three roadtrips between 9 and 12 hours each with the triplets and WOW what craziness. It definitely got easier each time. And we’re going on another one in a couple of months! I’m actually excited! :o) The babies will be a full year older from the last trip there and I hope it will mean a lot more freedommmmmmmm! I am curious – the straps on the sides of the carseats…what are they doing? Glad you laughed, it’s always my aim to at least make people smile during my posts – laughing is better! There’s no doubt that it does take bravery to embark on a road trip with triplets, so you are pretty awesome yourself! Well done to you – I’m in complete awe. How inspiring! WOW – you are one brave family !!!! We travelled lots with K but there is heaps to be said about travelling with one or travelling with 5 – I don’t think I would have been able to pull it off as successfully as you did – well done !!! Another thing about travelling with five kids and road trips – it’s generally cheaper, so I’m sure there will be lots more in the future. I think you’re all amazing for journeying so far and arriving back happy! 🙂 Family roadtrips are going to give your kiddos some great memories to treasure when they’re bigger. I really look forward to listening to my children when they are older and hearing what their memories are of events like this from their childhood. Some fantastic ideas!! We live in a rural area so most of our car trips involve at least an hour drive. I completely understand what you mean about sometimes it’s better not to stop at all. We drive back to Sydney fairly regularly and we find it’s better to do the three hour drive non-stop. Yes, we still travel regularly to 4 1/2 hours to our favourite holiday destination without stopping.